Using the browser, you can load wavetables into Expanse’s oscillators. You are not limited to the wavetables provided by Blamsoft. An easy place to start with wavetables in Expanse is just to load any samples you have lying around, or anything from Reason’s factory sound bank. Or use the sampling button to sample your voice or a guitar. Expanse will always do something with the audio data. Experiment! You can use the import setting (in the lower right-hand corner) to smooth out the wavetable by choosing a Crossfade or Spectral Morph with fewer than all of the frames. Crossfade is a smooth transition in the time domain, Spectral Morph results in a smooth transition of frequency domain components, or Off provides no transitions and uses all of the frames. Wavetables in a Serum-compatible format can be directly loaded into Expanse. You can also make your own Serum-compatible wavetables using Serum or other audio software, or programming environments that offer wav file output. The format is as follows. – Maximum of 256 frames (positions), less than 256 frames will be morphed or crossfaded according to the import setting. – For example, a 256 frame wavetable has exactly 524288 samples. If you use a powerful audio editor, such as Audacity, you can see the exact number of samples in the file. In addition to Serum-compatible wavetables, you can also sample an oscillator to create a wavetable. Expanse processes an audio sample and extracts the periodic waveforms present in the file. For Expanse to do this well, there are some things you can do to help. 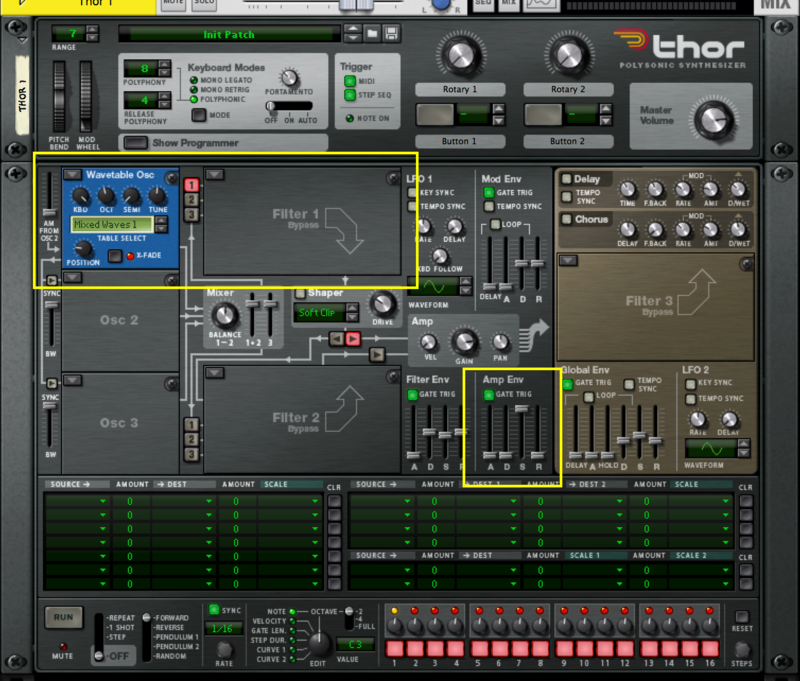 In this tutorial we will walk through an example of sampling Thor. We need a long steady tone from the oscillator. That means removing the effect of envelopes. Filtering can have an unexpected result when sampling an oscillator. It is best to listen to the oscillator at the pitch it will be sampled (covered below). In this example, we will not use filtering. In this Thor, we start with Reset Device. Then we are using the wavetable oscillator, the amp envelope provides a steady sustain, and filters are bypassed. This results in a raw sound of the oscillator. Create a long note on the Thor track. Low notes are best. These are the ideal notes based on Reason’s sample rate. Make the clip several seconds long, it is recommended to use at least 10 seconds. 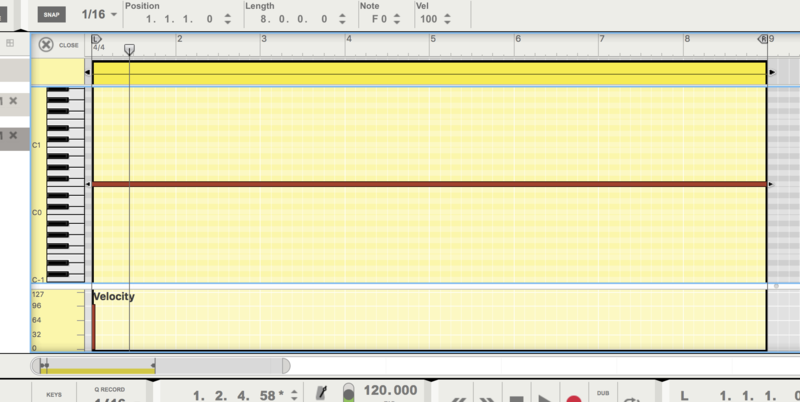 In this example, we use F0 for 8 bars at 120 bpm, that is a 16 second long clip. To extract Thor’s wavetable, we need to sweep through the wavetable settings. Right-click on the wavetable position knob choose “Edit Automation”. 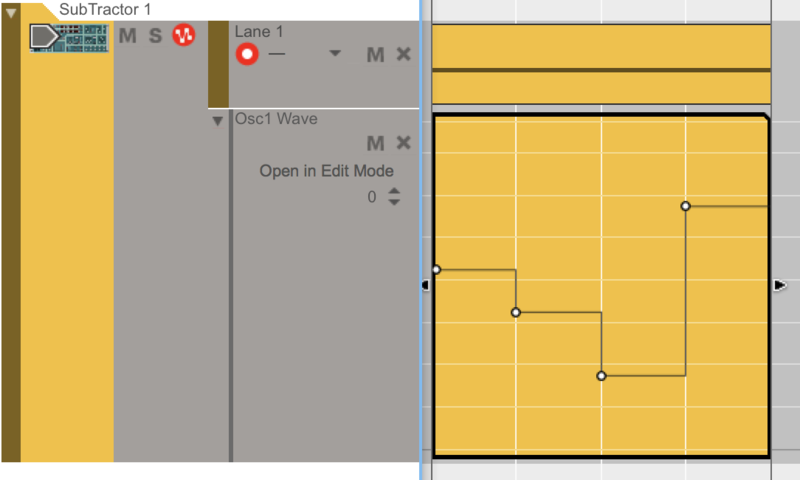 Create an automation clip that goes from zero to max on the wavetable position during the note. To capture the last setting, it may be necessary to end the automation sweep slightly before the end of the clip. Right-click on the note clip and choose “Bounce in place” to create an audio clip. Right-click on the new audio clip and choose “Bounce clips to new samples” to create a sample that can be loaded into Expanse. Create an Expanse synth and load the sample into an oscillator. That’s it! Now you have a custom extracted wavetable. You can use the sample editor to adjust the starting and ending points in the sample clip. In this section, we will create a wavetable that is a spectral morph of a few Subtractor waveforms. This time we will use Subtractor. Again we need a long steady tone from the oscillator, use the note recommended above. From the Reset Device patch, increase the filter frequency to max and the amp envelope sustain to max as well. This results in a raw sound of the oscillator. This time we will step through four waveforms. Right-click on the wavetable display choose “Edit Automation”. Create an automation clip that has four wave settings evenly spaced in the clip. Bounce the sample and load it into Expanse exactly as was done with the Thor sample. The last step is to choose Spectral Morph – 4 Frames as the import method. 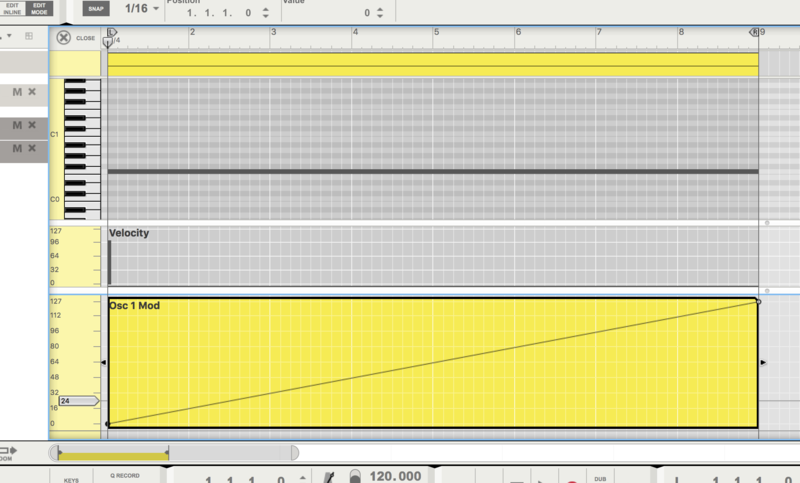 That will result in the four different waveforms being chosen as frames to morph. ReasonTalk member Stephen Pinton has graciously shared his Python code for creating a wavetable from a script. The full details are beyond the scope of this tutorial, but this code should give you a good start. That’s all there is to it. Have fun creating your own wavetables! I’m loving all these new features with Expanse, so much so that I’m going to purchase Reason 9 (with the update to 9.2) just so I can use this incredible looking synth. I noticed that lower frequency samples ( such as F0 ) are better for Expanse to read/scan, but how would it handle higher frequency samples such as vocal/voice samples? I have some great ideas for sound designing with this beast of a synth, I can’t wait to get it! Lower frequency samples are much more likely to get the exact waveform. You might still have luck with higher frequency samples. You will at least get something, maybe it will be useful in combination with the Spectral Morph settings. Just bought Expanse, and experimented with vowel samples created in reason. Using a key reset LFO to play the wavetable “start to end”, sampler style, I had great success with some files, but not with others. Question 1: The successful ones, could it be because they by pure chance were multiples of 2048 samples in length? Or was it purely because of file content/data? Computer crashed, so couldn’t export and analyse files in Sound Forge. Question 2: Going forward with custom wavetable creation in Sound Forge, am I correct in assuming that a good/successful wavetable is a multiple of 2048? Or should the be the full 256*2048? At 44.1 kHz, that’s a rather long sample, I’d even say excessive for most cases. I’d love to have a discussion with Daniel about creating wavetables. Is this a good place for it? It is unlikely that you had a sample length that was a multiple of 2048. The import algorithm works best on low sounds that are constant in pitch, near the pitches listed. To make your own wavetable, it can be any multiple of 2048, but if it is not a multiple it will be processed and not be exactly what you created. If you email info@blamsoft.com I can put you in touch with Daniel. Wow, thank you for the quick reply! That’s the thing, it worked even without the import algorithm! Will try to reproduce today. You have a great, great synth here! A really “mature” product. One could nudge closer to optimum by tweaking the cents, I suppose? That should give an error of about half a sample. Would some Reason instrument support sub-cents, -23.44c and +23.26c gets closer yet. To double the sample rate, go exactly one octave up. Keep the cents. Good point. Expanse makes it so you don’t have to worry as much because of its pitch detection and resampling.